Each unit has a different combination of internal space, Gratnells trays and cupboards; designed to cope with different sizes of books, files, papers and magazines. Enough to satisfy the requirements of all but the most demanding of managers and teachers. You can even choose the colour of your Gratnells trays… red, blue, green, yellow, purple, clear. 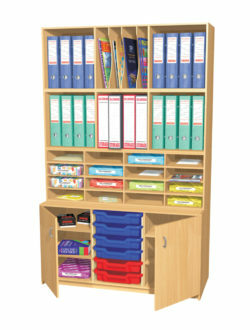 The units are delivered to your organisation fully assembled (not flat packed) and are manufactured in the UK. One particularly useful feature is that although they provide so much storage and filing capacity they are only 456 mm deep, so they don’t take up much floor space. In this respect they are probably the most effective, easily accessible means of storage and filing available.